At the invitation of Minister of Foreign Affairs and Cooperation Isselkou Ould Ahmed Izid Bih of the Islamic Republic of Mauritania, Minister of Foreign Affairs Luis Filipe Tarares of the Republic of Cape Verde, Minister of Foreign Affairs and International Cooperation Abdoulaye Diop of the Republic of Mali, and Minister of African Integration and Ivorians Abroad Aly Coulibaly of the Republic of Coate d'Ivoire, Foreign Minister Wang Yi will pay official visits to the aforementioned four countries from May 19 to 23. Q: Yesterday, Czech President Zeman visited the Nanjing Massacre Memorial Hall. What is your comment on his visit? A: The Nanjing Massacre is a grave crime committed by the Japanese militarism during the WWII, which is a historical fact recognized by the international community. 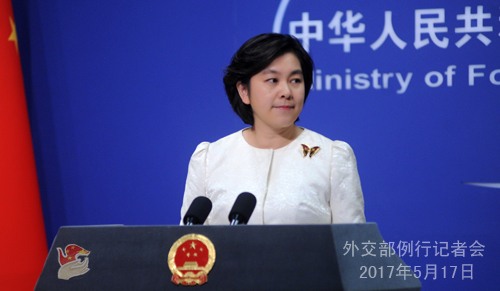 China spoke highly of President Zeman's visit to the Memorial Hall to the Victims in the Nanjing Massacre to pay tribute to those innocent lives fallen during the Nanjing Massacre. President Zeman was also present in 2015 for the commemorative activities for the 70th anniversary of the victory of the Chinese People's War of Resistance Against Japanese Aggression as well as the World Anti-Fascist War. From all these, we can feel President Zeman's respect for history, his courage to acknowledge the past so as to look into the future. The Chinese people will always remember that. Q: The US Ambassador to the UN Nikki Haley said yesterday that the US believed that it could persuade China to agree to new sanctions on the DPRK. Can you give us details on the discussions China is currently having with the US in the Security Council? Can you give us a time-frame as to when China expects that a possible agreement is reached? A: The international community has an important consensus on the Peninsula nuclear issue, which is strong commitment to the goal of denuclearization of the Korean Peninsula, full and strict compliance with the Security Council resolutions, and support for peaceful means to resolve the Peninsula nuclear issue. China believes that relevant discussions and actions by the Security Council should be in the same vein with such a consensus. China will continue with its efforts to ease up the situation and contribute to the final peaceful settlement of the Peninsula nuclear issue. Q: Taiwan confirmed today that Fiji has withdrawn its Trade and Tourism Office in Taiwan. We also heard that Fiji officials went to Taiwan to handle the relevant matter. Are you aware of this? Does this withdrawal have anything to do with pressure from the mainland? Does this signal the resurgence of a "diplomatic war" between Taiwan and the mainland? A: I want to stress once again that there is only one China in the world and Taiwan is part of China. This is also a consensus of the international community affirmed by a series of international documents including UN resolutions. Upholding the One China principle meets the common aspiration of the international community and conforms with the trend of the times. Q: Philippine sources said that China would not conduct land reclamation activities in Huangyan Dao in the next 12 months. Can you confirm that? 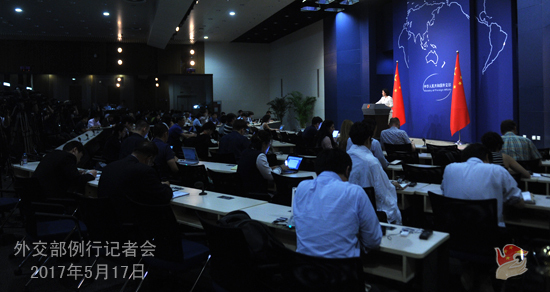 A: China's position on the relevant issues surrounding Huangyan Dao is consistent and clear. Whatever we choose to do or not to do is within our own sovereignty. China will properly deal with relevant issues. At this moment, China and the Philippines are enjoying a sound momentum in developing the bilateral relationship. Practical cooperation in various fields are rapidly moving forward. The two countries are on the track of implementing the consensus reached between the two leaders on upholding good neighborliness and friendship, properly handling disputes and working together for common development. Political mutual trust and mutually beneficial cooperation between the two sides have been deepening. China will remain committed to sustaining the sound and steady development of the China-Philippine relationship. Q: The international community in general gave a high appraisal to the BRF. But we also hear some voices saying that China meant to use the BRF to lift its own international influence and leadership. How do you respond to that? A: It is true that for several days on end we've been receiving high opinions from the attendees and the international community on the Belt and Road Initiative and China's hosting of the BRF, which are believed to be conducive to making the economic globalization more inclusive and balanced and providing important opportunities for promoting international cooperation and realizing common development. It is China that proposed the Belt and Road Initiative, but the principle this Initiative follows is "joint consultation, extensive participation, and shared benefits". We firmly believe that it is a cause that concerns everyone, and therefore shall be discussed among everyone and undertaken by everyone. And no one will be left out when it is time to reap benefits. Instead of saying that China is trying to act as a leader or project international leadership, I would prefer saying that China never shies away from its responsibility. China always maintains that all countries are equal, regardless of their sizes. China also believes that large countries, boosting relatively more resources and more capabilities, shall naturally assume more responsibilities and make more contributions. China's proposal of the Belt and Road Initiative and hosting of the BRF are the exact and specific manifestation of such a spirit that China never shirks its responsibility. Q: It is reported that the Shadow Brokers, a hacking group, said that, from June, it will begin dumping data from Chinese, Russian, Iranian and the DPRK missile and nuclear programmes. Is China aware of this? What is China's response? A: I don't have any information. But China's position on the relevant issue is consistent. 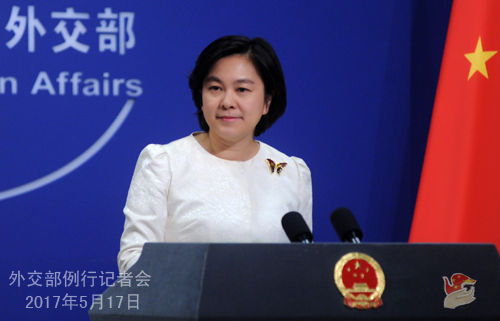 China firmly opposes and cracks down on all forms of cyber hacking activities. We advocate greater cooperation and dialogue among the international community on the basis of mutual respect, equality and mutual benefit to jointly address the threat to cyber security. Q: It is reported that the Taiwan authority held a ceremony on May 17, announcing the change of the name for its organization tasked with handling ties with Japan. The new name is "the Taiwan-Japan Relations Association" which was formerly known as "the Association of East Asian Relations". Representative Mikio Numata from the Japan-Taiwan Exchange Association attended the ceremony. What is China's comment? A: There is but one China in the world, and Taiwan is part of China. The Chinese government resolutely opposes any official exchanges between Taiwan and countries having diplomatic ties with us. The name change jointly staged by the Japanese government and the Taiwan authority is in fact meant to elevate and put more substance to the relationship between Japan and Taiwan. China is strongly dissatisfied with that. We urge the Japanese side to adhere to the principles of the Sino-Japanese Joint Declaration and the promises it has made so far, uphold the One China principle, take concrete actions to correct its mistakes, and avoid sending a wrong message to the Taiwan authority and the international community, nor creating new disturbance to China-Japan relations. We would also admonish the Taiwan authority that all attempts to create "two Chinas" or "one China, one Taiwan" are destined to fail. Q: First, what does China expect from the BRICS Summit coming up in September in Xiamen. Have all countries confirmed their attendance yet, especially India? Second, speaking in Tokyo today, Commander Harry Harris of the US Pacific Command spoke about the urgency of China dealing with the nuclear issue in a more robust way, saying that its nuclear programme is a threat even to allies of the DPRK, such as China and Russia. What is your comment? A: On your first question, China will host the BRICS summit in Xiamen in September, which is a major event for China's diplomacy. China will remain in close communication and coordination with other BRICS countries to make the Xiamen summit a great success, contributing to consolidating solidary among BRICS countries and promoting common development of the BRICS and development countries. As for how the preparation is going at this point, I have no specific information to offer. On your second question, we have clearly stated our position on the Peninsula nuclear issue on many occasions. As a permanent member of the UN Security Council and a close neighbor to the Korean Peninsula, China has been and will continue implementing relevant resolutions of the Security Council comprehensively and faithfully. Meanwhile, we will make unremitting efforts to cool down the situation on the Peninsula and strive for a final peaceful settlement of the Peninsula nuclear issue. Q: It is reported that Japan's LDP general president Nikai Junhiro expressed Japan's intention to join the AIIB on the sidelines of the BRF. Has China received any notification from the Japanese side? A: The AIIB is an open and inclusive multilateral organization for development. It absorbs new members in accordance with the Agreement of the Asian Infrastructure Investment Bank. If Japan want to join it, it may make its intention known by directly submitting its application to the AIIB.